Preface. Contents of volumes 1-20. 139. Separation chemistry (R.G. Bautista). 140. Corrosion prevention and control (B.W. Hinton). 141. High-temperature corrosion protection (N.E. Ryan). 142. Rare earth intermetallics for metal-hydrogen batteries (T. Sakai, M. Matsuoka, C. Iwakura). 143. Chemical sensors (G.-y. Adachi, N. Imanaka). 144. Crystal field in non-metallic (rare-earth) compounds (D. Garcia, M. Faucher). 145. Solvation and anion interaction in organic solvents (J.-C.G. Büzli, A. Milicic-Tang). 146. Trace determination of lanthanides in high-purity rare-earth oxides (V. Bhagavathy, T. Prasada Rao, A.D. Damodaran). Author index. Subject index. The contributions to this volume focus on selected chemical aspects of rare-earth materials. The topics covered range from a basic treatment of crystalline electric-field effects and chemical interactions in organic solvents, to separation processes, electrochemical beaviors which impact corrosion, oxidation resistance, chemical energy storage and sensor technology, and to analytical procedures. Underlying the most subtle chemical and optical properties of these elements and their compounds in the condensed state are the crystal field effects. This phenomenon in non-metallic compounds is discussed in chapter six. The volume opens with a review of important new solvent extraction procedures as well as emerging alternative separation processes such as photochemical separation, precipitation stripping and supercritical extraction. Scientific and industrial procedures are illustrated. In a further chapter eight major analytical techniques of obtaining accurate trace analysis are examined, tabulated and assessed. The most effective procedures of each are also reviewed. Chapter two considers a wide variety of methods using rare-earth solutions and slats to modify advantageously the costly deterioration of metals and alloys. This topic is expanded in the following chapter, paying particular attention to protection against high-temperature oxidation, sulfidization and hot-salt corrosion. 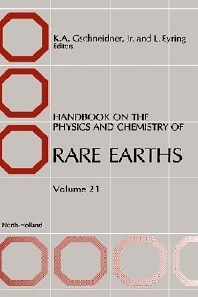 The following two chapters are concerned with the versatility of the rare earths in addressing current technical problems such the use of rare-earth intermetallics, principally LaNi3-based materials, to provide the skyrocketing need for environmetally friendly, usually portable, battery power. The final chapter is a review of the solvation, interaction and coordination of rare-earth salts in a variety of organic solvents including dimethylacetamide, dimethylsulfoxide, various alcohols, acetonitrile and propylenecarbonate under strict anhydrous conditions. A contrast of these interactions with those in which water is present with organic solvents is also made.